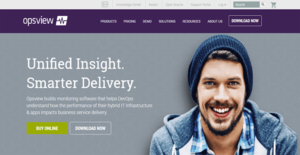 Opsview Monitor is a software that aids DevOps in gaining an in-depth understanding of their IT hybrid infrastructure and apps performances and how they affect the distribution of services across the board. The application unifies available insights to provide users with data they can utilize to transform their delivery systems. Opsview Monitor also enables businesses to put their monitoring processes on auto-pilot. With this, they can focus on other IT tasks while having the peace of mind that they are instantly notified in case of issues to immediately deploy mitigating actions. And if or when the organization requires scaling, they can rest assured that Opsview Monitor rises to the occasion. Scaling is enabled by the solution due to its elastic infrastructure that is equipped with, among others, multi-tenancy possibilities. Instead of spending a disproportionate amount of time searching for the root causes of issues, IT administrators can promptly find them through Opsview Monitor’s capability of unifying data to generate actionable insights. This affords the IT unit more time innovating, such as finding ways to align the workflows of different teams. With Opsview Monitor, businesses can continue employing the existing monitoring logic they have. This is facilitated by the software’s capability of reusing Nagios plugins and service checks, thereby allowing IT and DevOps teams to save time from generating new codes. Opsview Monitor is capable of integrating with a company’s pre-existing or additional enterprise solutions. This makes it easier for various departments to relay information to each other, especially when it comes to support. Furthermore, the DevOps unit is empowered by a host of integration abilities with service desks, configuration management tools, organization communication clients, information visualization solutions, enhanced reporting applications, and more. Opsview Monitor has a gentle learning curve, thereby enabling new users to become familiar with its tools and features in quickly. This allows teams to work more efficiently with a new member, so as not to further disrupt the workflow with lengthy training. Opsview Monitor reduces the manpower required to monitor the infrastructure. Because of this, the business can also cut costs when it comes to their workforce expenditure as the solution takes care of examining the network. Aside from that, the software is also poised to instantly alert IT administrators if an issue arises. If you are interested in Opsview Monitor it might also be beneficial to check out other subcategories of Best Network Management Software gathered in our database of B2B software reviews. Each enterprise has different wants and requires an application that can be personalized for their size, kind of workers and buyers, and the particular industry they are in. For these reasons, no system can proffer perfect functionality out-of-the-box. When you look for a software product, first be sure what you need it for. Read some Opsview Monitor reviews and ask yourself do you need basic tools or do you require sophisticated tools? Are there any industry-specific features that you are looking for? Obtain the answers to these queries to help your search. There are multiple aspects that you need to consider and these include your budget, specific business wants, your organization size, integration requirements etc. Take your time, use a few free trials, and finally zero in on the system that presents all that you want to improve your company effectiveness and productivity. How Much Does Opsview Monitor Cost? Opsview Monitor offers the following SMB and enterprise pricing packages for users to choose from. Give the details a look, and select the best plan for your business. We realize that when you make a decision to buy Network Management Software it’s important not only to see how experts evaluate it in their reviews, but also to find out if the real people and companies that buy it are actually satisfied with the product. That’s why we’ve created our behavior-based Customer Satisfaction Algorithm™ that gathers customer reviews, comments and Opsview Monitor reviews across a wide range of social media sites. The data is then presented in an easy to digest form showing how many people had positive and negative experience with Opsview Monitor. With that information at hand you should be equipped to make an informed buying decision that you won’t regret. What are Opsview Monitor pricing details? What integrations are available for Opsview Monitor? For more information, visit the website for the documentation or contact support. If you need more information about Opsview Monitor or you simply have a question let us know what you need and we’ll forward your request directly to the vendor.